This post contains affiliate links to help you find the items you’ll need to plant your own windowsill herb garden and save money on herbs. Many people want to enjoy all of the freshness and flavors of an herb garden, but don’t think they have the room for one. Maybe it is because they live in an apartment, or just don’t have the backyard space. Well here is the good news, it doesn’t matter! You don’t need anything more than a sunny window sill to enjoy a plentiful herb garden. That’s it! If you have a window that gets at least six hours of sun a day, then you have the perfect spot for a windowsill herb garden. Can you imagine having fresh herbs at your own fingertips? Wouldn’t you love to send the kids to snip a few fresh chives for your baked potatoes at dinner time? A windowsill herb garden will add not only flavor to your family’s meals, but lots of fun. Plus, it’s a great way to save money on herbs! 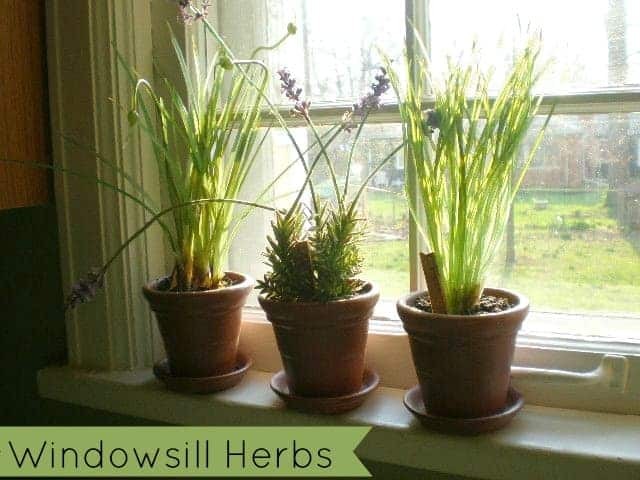 A windowsill herb garden can be started at anytime of the year. Take a look below at how easy and inexpensive it is to get started! You are just a few weeks away from your first herbs sprouting and being ready for use. First, let’s take a look at the supplies you will need. The best part is, most of these supplies can be found at your local dollar store! You don’t need to spend a lot or buy anything fancy. Simple will do you just fine. Between planters, seeds, and soil, you should be able to plant an herb garden with 3-5 varieties for under $10.00. Considering the fact that fresh herbs from your local market or grocer can cost you $5.00 per small plastic clam shell container, you can see how growing your own is a real value that can help you save money. 3-5 small planters. Terracotta is fine, 3 inches in diameter is ideal. You can also use a long and narrow planting box if you wish. Just be sure both items have holes for draining. My dollar store carries a large assortment of these. Potting Soil. My dollar store sells 3 lb. bags for $1.00. Assorted herb seeds or starters. Seeds will of course be less expensive costing around .50 per pack. Starters will cost you around $3.00 each. Plant markers. Wood Popsicle sticks will do! Choose your window you are going to use. It must get 6 hours of sunlight a day. Either place your planting box and pots directly on the windowsill, or place a small table up to it. Fill each of your planters ¾ full of potting soil. Make a 1.5 inch hole in each and drop in 2-3 seeds, or, bury as much space as you need to add your starter plant. Pack the soil in around your plant or seeds and water well. Place in the window and let the sunshine do its job! Take your popsicle sticks and use a black marker to write down the name of each herb. This will help you remember which plant is which. Many herbal plants tend to look alike so this will be very helpful later on. A simple stick is all you need to use as a marker, or you can find more decorative ones at your local dollar store, retail store, or gardening center. If you used seeds, you should see sprouts in just a few weeks! If you used a starter plant, you should be able to start harvesting right away. When picking your herbs, you want to start by picking the larger, more mature leaves on the bottom of the plant. Do not pick the smaller, younger leaves at the top. When you pick, pick close to the stem. Herbs can either be used right away, or even frozen for later. Freezing is a great way to preserve those fresh herbs for later months when they are no longer growing. Don’t forget to water your plants as needed. You can tell when it is needed by placing your fingers in the soil and seeing if it is damp. It should always be damp but not saturated. How easy is that? Keep your small watering can nearby for easy access, or you can also keep a spray bottle near to give the plants a refreshing mist. Should you see your plants looking a little down and out, try adding a little plant food, or placing outdoors for some extra light. You can also prune away any yellow leaves or leaves that look diseased or sick. This will help keep the plant strong and flourishing. As you can see, your own windowsill herb garden is fun and easy to grow. You can easily get the family in on the action as you grow your own fresh and tasty herbs in your own home. You can even get your kids interested in gardening! Happy growing! Katie is the owner of The Savvy Luna Bugg Handmade & Vintage Shop, and runs a blog under the same name. She can usually be found out and about scouring thrift stores, with a diet soda in one hand and vintage linens in the other. Always seeing the glass half full, she loves finding new uses for old objects, crafting with her two daughters, and teaching others how to see past the trash and to the treasure. What a great idea! It never occurred to me to try this inside rather than outside. I would absolutely love to do this, but I worry about bugs. A windowsill garden is such a great idea! I’m in a small apartment so I never thought about gardening but I could place them in front of a window – never thought of that! I’ve always wanted to do this. I wonder if our house being in the woods will get enough sun though. It’s so marvelous to have plants indoors and herbs are even useful as well as lovely. Great tips you have here. Adding some greens into the house creates a better ambiance. I love growing stuff indoors, esoecially since our MN outdoor growing season is so short. Kids on A Plane Says Our Sling Bags Are Very Versatile!